The majority of people mis-sold payment protection insurance may not yet have made a claim - and they are being urged to do so by Arnold Schwarzenegger. The Financial Conduct Authority (FCA) has set a deadline of 29 August, 2019, for the final PPI claims to be made. 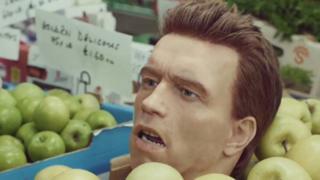 A major advertising campaign by the FCA features a model head and voice of Arnie - urging people to act now. So far, £27bn has been paid out in compensation with major banks having set aside more than £37bn. PPI was supposed to cover repayments of loans if policyholders fell ill or lost their job. Millions of people who did not want or need PPI, or could have never made a claim, were mis-sold PPI primarily between 1990 and 2010. The subsequent compensation scheme has revealed it to be the UK's biggest financial mis-selling scandal. The new advert, in cinemas and on television from Tuesday, features an animatronic model of Schwarzenegger's head. In the voiceover, the actor and former governor of California, urges people to "make a decision" over PPI claims and to "do it now!". There are also billboards in a similar style. Andrew Bailey, chief executive of the FCA, said: "Our campaign aims to cut through the noise on PPI. We want to encourage people to decide whether to find out if they had PPI and whether to complain or not." The £42m awareness campaign, which includes a dedicated call centre for PPI queries, is being paid for by the 18 banks, building societies and credit card providers which sold the most PPI. Eddie Harrison, from Glasgow, was a freelancer and so did not need the insurance, but was told he could not have had a credit card without it. He said his pursuit of compensation took three years. "The first offer that they gave me was £2.86, but the actual amount that they ended up paying me was a four-figure sum," he said. "I had an account with this bank from when I was a little kid. "I had my home insurance with them. I had my mortgage with them. I had pretty much everything with them. "Obviously I don't have that anymore because there is a distrust between me and the bank I was with." He said that only after writing letters, making phone calls and taking his case to the financial ombudsman did he finally have a satisfactory result. "At the end of the day, there were thousands of pounds that were wrongly taken from my account that were eventually put back in again. "I will never know if it was the full amount, but it was thousands of pounds that belonged to me that were returned under duress, so I would do it all again and certainly recommend to anyone else to do it," he said. More information on PPI and how you can claim is available on the FCA website. A free phone line, managed by the FCA, can be called on 0800 101 8800. Various templates are also available to download, along with guidance on claiming, on websites such as Which?, MoneySavingExpert, and Resolver. Cliff D'Arcy worked in a bank's PPI department for 11 years and said that sales were incredibly lucrative for the industry. Now, as a freelance financial journalist, he believes that there has been a degree of underestimation in the figures and that many fair claims for compensation were dismissed. The regulator, the FCA, said that many people may still be unaware that they ever had PPI and anyone who had a loan should check any paperwork they still had. Many banks no longer have paperwork for loans and cards from that time. A dedicated call centre will be set up as part of the FCA's multi-million pound campaign unveiled later. A spokeswoman for UK Finance, which represents the major banks, said: "We fully support the introduction of the FCA's PPI mis-selling deadline. "The regulator's deadline for PPI complaints provides additional clarity for consumers, with the accompanying awareness campaign intended to prompt action and help ensure that customers who deserve compensation receive it." Consumer groups, such as Which?, say that now a deadline has been set, banks should do more to make it easier for people to make a claim, which can be done for free. These groups are concerned that consumers will go to claims management companies - businesses that offer to do the paperwork but take a cut of up to a third of any payout. Resolver, a website that offers free advice to consumers on how to complain, said that more than 80% of the PPI complaints made to the financial ombudsman last year were made by claims managers, and that there are 1,388 claims managers registered in the UK. It is likely that the two-year deadline will lead to a wave of text messages and calls from firms selling leads to these companies. But Nick Baxter, chairman of the Professional Financial Claims Association, the trade body for claims companies, said its members kept to a code of conduct which controlled the amount of time people could be contacted after ticking a box to accept marketing calls. He added that their fees were transparent and justified and that many people would not have received a payout at all, had they not used these services. These companies, consumer groups, and the regulator are also raising awareness of a Supreme Court case, known as the Plevin case, which means 2.4 million rejected compensation claims may now be able to make a fresh appeal. The ruling dealt with the case of a financial company's client not being made aware of a commission being paid when they were sold PPI. The court agreed that the company's failure to tell its client that it was receiving a large commission for the sale was unfair. Now the FCA has ruled that banks should have declared its commission if it was over 50%. If they did not declare it, then the customer is entitled to the return of any commission over 50%, plus interest, even if the PPI was not mis-sold.